Mummy Of 3 Diaries: Ping and Pong. Ping and Pong is a lovely new book written by Amy Trevaskus. It tells the story of two little people names Ping and Pong who live in a clock. They go on big adventures with the little girl who lives in the house named Lucy. 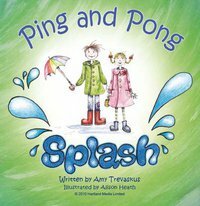 In this book titled "Splash" they take a trip too the park where they have a lot of fun and get up too some exciting things. They feed the ducks and play in the playground,each having their turn on their favourite thing. Its a lovely little story and is very well written and illustrated. I read the story too my two girls,Chloe aged 8 and Lily aged 3 as a bedtime story the other day too see what they thought and they both loved it.Lily liked the pictures and the story,she was able too relate as she too loves going too the park and splashing in puddles lol Chloe is a bit older but she said it was good,She liked the idea of little people and was asking me "do we have any little people in our house?" and "are they real,mum?" I had too laugh,bless her but i did tell her its just make believe and too leave my clocks alone. I have read this story several times since that night and its still just as enjoyable for me too read as it is for them too listen. I was looking for it too help me with my review but it wasn't on the shelf where i had left it... I found it eventually but it was tucked in bed next too my little Lily,she must have picked it up too look at the pictures as she can't quite read the words yet. How naughty but totally sweet. So yes overall they gave this book a thumbs up! Both liked the pictures and thought the story was very fun.Maybe you would like too read it too your children and who knows it could become their favourite bed time like it has for Lily.